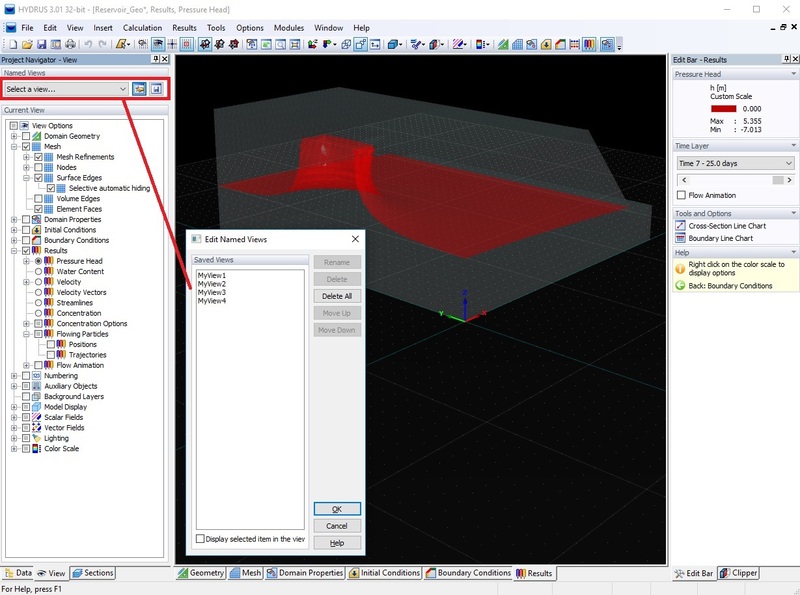 The purpose of the tutorials given below is to give HYDRUS users hands-on experience with new GUI features introduced in version 3 (released in May 2018). HYDRUS 2.x offers a variety of tools for manipulating geometric objects (shift, rotation, stretching ...), but these operations can only be performed numerically through dialogs, which is not always optimal. HYDRUS 3.x provides additionally the ability to perform graphical manipulations, while it is also possible to combine graphical and numeric inputs, i.e., to perform an approximate operation in the graphical mode, and to enter the exact value for displacement or rotation at the end. An example of working with a graphical manipulator can be seen in the enclosed video. 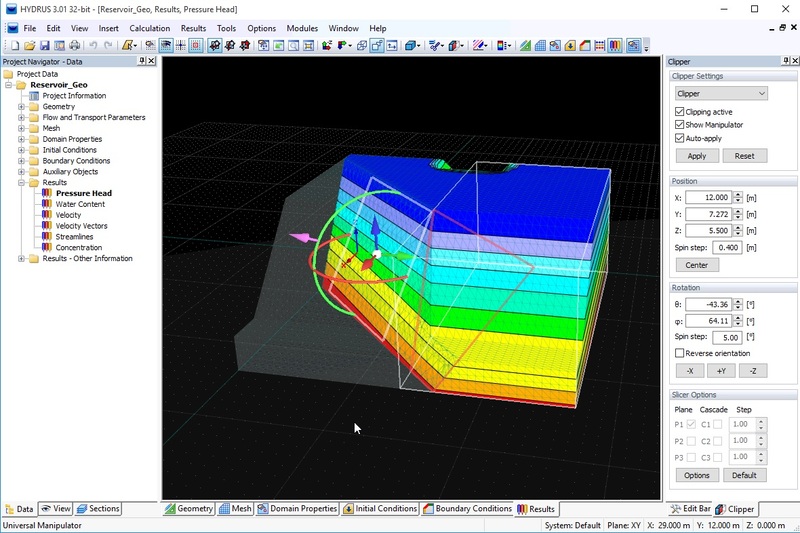 The graphical manipulator will make it easier to define computational areas of more complex shapes. 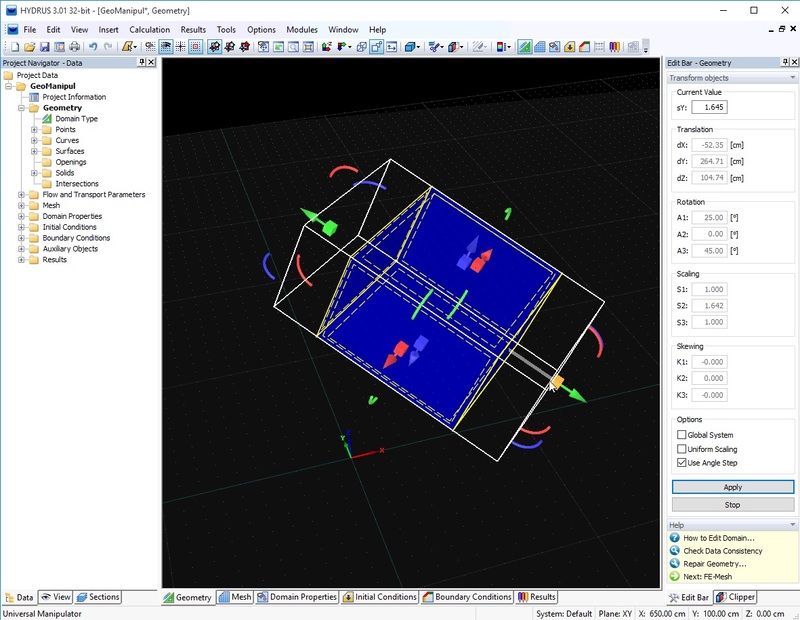 In previous versions of HYDRUS 2.x, it is possible to display values within a 3D area using Mesh-Sections, which are based on hiding selected points/elements of the FE Mesh. 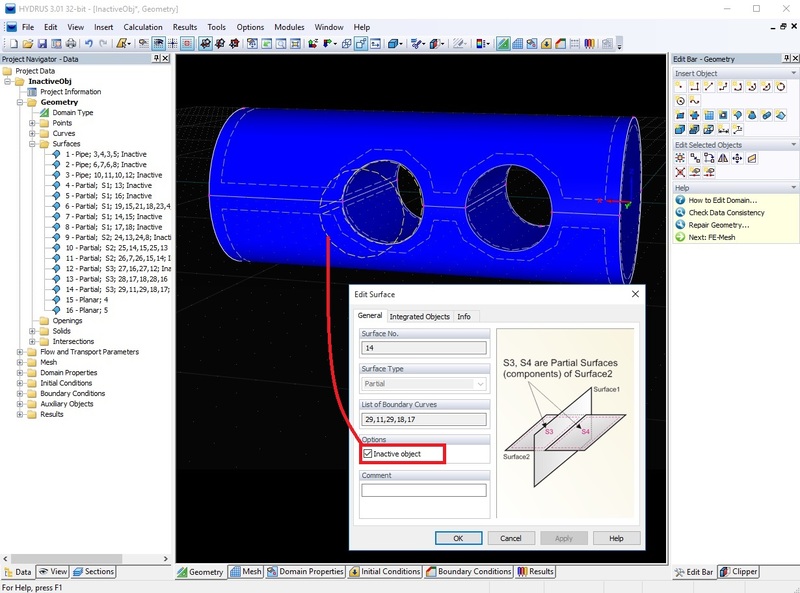 HYDRUS 3.x extends these capabilities to a Clipper and a Slicer, which are tools for obtaining straight cross-sections (planes) throught 3D domains and then displaying data on these planes. For the plane obtained by a Slicer, it is also possible to display a 2D chart on any line located in the plane. The basic Clipping and Slicing features are shown in the enclosed video. Velocity vectors has so far been displayed on nodes of the FE Mesh. However, this is not particularly suitable in 3D problems, in which the finite element mesh often has hundreds of thousands of nodes. Then, the display of the velocity field is unclear and slow. 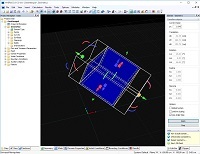 The new version of HYDRUS 3.x has therefore a new option to display the velocity vectors at regular grid points, the density of which can be chosen by the user at their discretion. 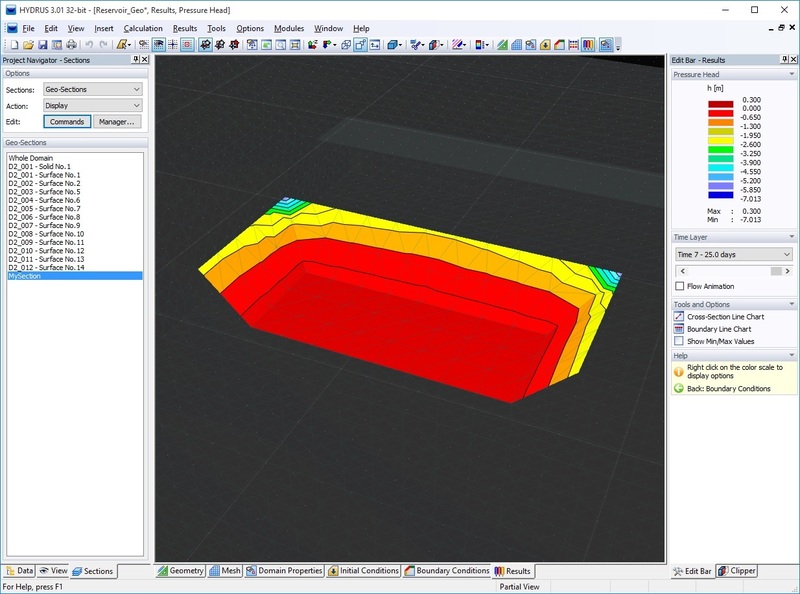 The raster can also be used on the Slicer planes. 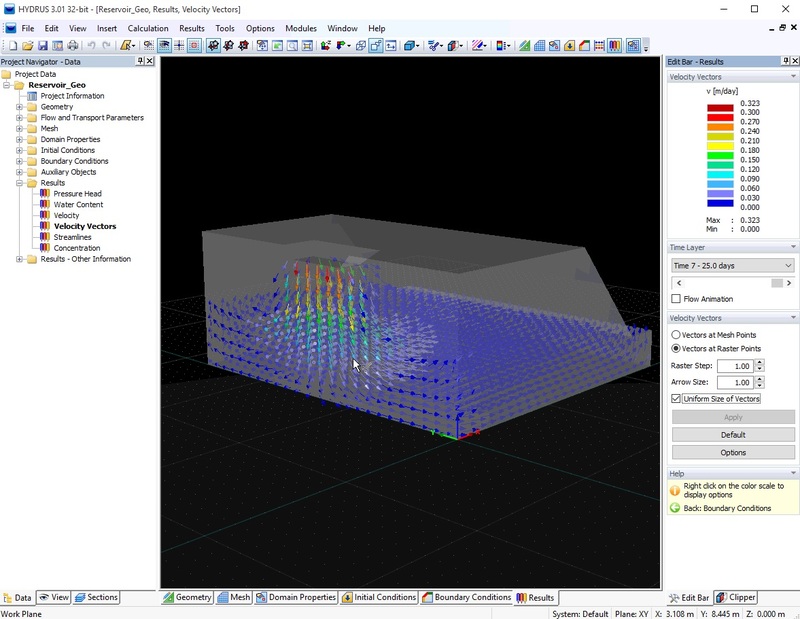 HYDRUS 3.x offers a new streamline visualization option. Streamlines are evaluated from the flow field at the given time step and do not take into account possible non-stationary flow, i.e., the particle trajectory calculated in this way may not match the particle trajectory for non-stationary flow (the calculation of particle trajectories in 3D problems is also one of the new options in version 3). If the flow is steady of changes only slightly, the streamlines are identical to the trajectories of the particles. 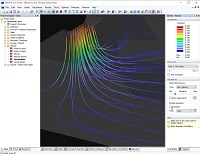 The calculation of streamlines is always done from so-called "seed points" that can be generated in different ways. Default seed points are placed in nodes of the FE Mesh where the flow rate is maximum. However, the user can place seed points at any point in the area - see, for example, seed points generated on the rectangle in the enclosed video. 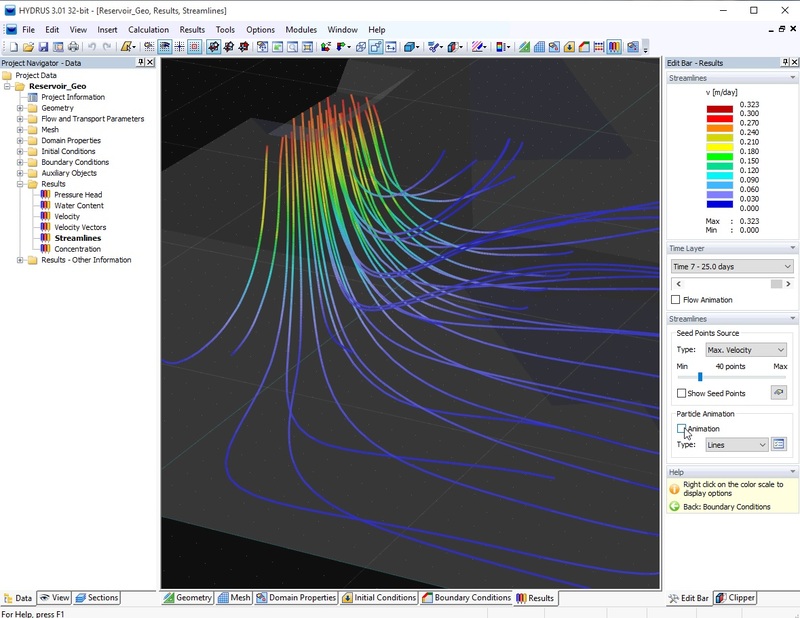 The display of streamlines has many options for user settings and it is also possible to display animation of particles moving along computed streamlines. When working with more complicated areas, it is often appropriate to divide the area into smaller / simpler parts, allowing you to display only certain parts as needed, while other parts of the area are hidden. For this purpose, so-called Geo-Sections (parts of the area formed by geometric objects) and Mesh-Sections (parts of the area formed by FE nodes and elements) are used. HYDRUS 3.x brings new capabilities to work with these Sections. For example, it is possible to synchronize the visible part of the FE mesh according to the selected Geo-Sections. It is also possible to select the finite elements and nodes by selecting geometric objects (bodies, surfaces, curves, and points) in the Navigator Data tree. An example of these new options is provided in the enclosed video. Some topological objects needed to create the geometry of the computational area are only auxiliary, i.e., they are not taken into account when generating the finite element mesh. Examples include cut-away parts, curved axes of the Pipe surfaces, and similar. HYDRUS 3.x provides a new option to hide these objects automatically so that they do not interfere when viewing topology of the transport domain. The Inactive Object check box can be found in the dialog of each object and in the popup menu that appears when the object is clicked on with the right mouse button. Inactive objects have an added "Inactive" note in the Navigator Data tree. An example of how to turn on / off the activity of the objects is in the enclosed video. HYDRUS 3.x allows you to save different views with any settings and then to recall them quickly. This is especially useful when the View settings are not completely simple - for example, special clipping, along with streamlines, and so on. Saved views can also be used for the purpose of to present results in a program. This video shows the work with Named Views.